Mur-lok RO fittings are the only RO fittings that feature dual EPDM O-rings to ensure a straight leak free fit. These high quality American made fittings are constructed with FDA approved materials. 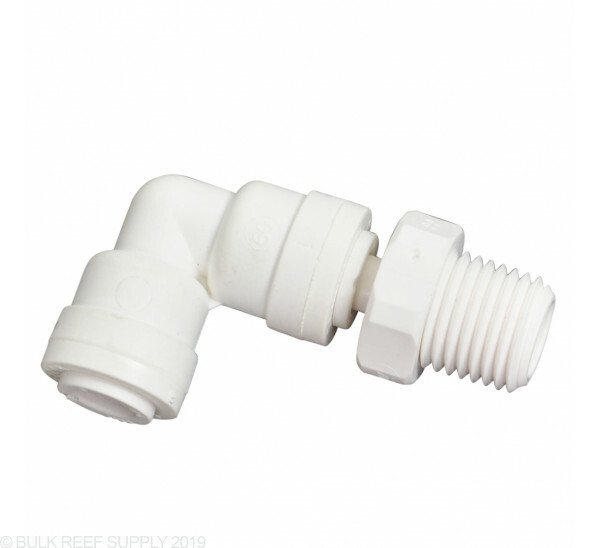 Mur-lok Swivel 90 Degree Elbow 1/4"
Mur-lok RO fittings are the only RO fittings that feature dual EPDM O-rings to ensure a straight leak free fit. These high quality American made fittings are constructed with FDA approved materials. We assemble our Reverse Osmosis units and Media Reactors virtually exclusively with Mur-lok fittings. These things really are a luxury to use, the swivel makes things nice and easy while plumbing for ATO / Dosing containers. The fact that they are removable/reusable is really nice when you make a mistake on length of tubing or want to change plans/locations. Will not hesitate to order more of these when the task calls. I ordered three BRS canisters with 1/4" ports, and six of these swivel fittings. These fittings allow you to position the ports where you want them without worrying if they are tight enough to not leak. Simply tape the threads, snug them down, swivel them into the position of your choice, and you've got adjustable, leak-free connections. Great quality and much better than rigid fittings. Great fitting for akward angles and for easy maneuverability of canisters. Just make sure you use thread tape to prevent leaks. Used this to add another sediment filter to my Ro system. While tightening the thing snapped leaving the male end in the canister. Unfortunately i was unable to get it out leaving with me buying 2 more of these guys and a new canister.